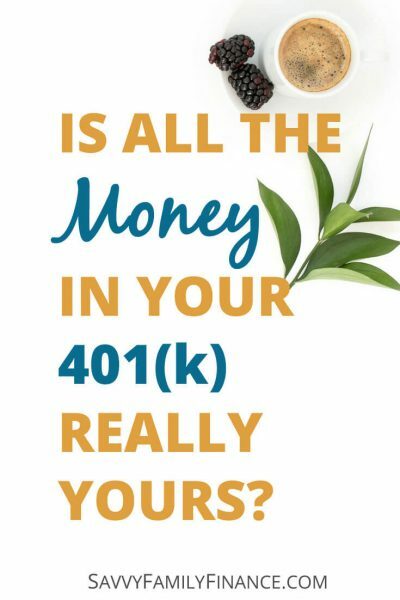 Inside: Is all the money in your 401(k) really yours to keep? It may not be, depending on the vesting schedule and your tenure at work. Vesting may sound like a ceremony of sorts, like a golf Masters champion receiving a green jacket. Alas, it is not. In this case, we are talking about 401(k) vesting in a retirement plan. As boring as that may seem, it is important to know why some of the money sitting in your 401(k) just might not be yours to keep, yet. Why are there vesting policies? Vesting means ownership and the right to keep your employer’s matching contributions. Any contributions YOU make, you own 100% so no worries there. When you leave the company, the amount of your 401(k) matching contributions that is actually yours depends on how vested you are. Depending on the plan that has been set up, you may not own 100% of the contributions your employer made. At least, not yet. If you are unsure what the vesting schedule is at your company, ask your human resources representative for the 401(k) plan summary description. In the description there should be a section on vesting. Your HR representative should be able to clarify any questions you still have. Another source of information is often your 401(k) statements. Many will show both your contributions and your employers’ contributions. Some statements may even list your current vesting percentage. Some employers offer immediate vesting of matching contributions. This means all employer contributions are immediately yours and they cannot take the contributions back. Cliff vesting is pretty much what it sounds like. Your ownership in the employer contributions is flat (0%) for some time and then you suddenly have full ownership. The employer may choose a schedule more favorable to the employee, such as offering 100% vesting after only 2 years of service. Again, the employer may choose a more generous schedule such as 25% / 50% / 75% / 100% where the employee is fully vested in a shorter amount of time. It isn’t the minimally required schedule, but it is acceptable because it is more favorable to the employee. So, what happens if you leave your company before you are fully vested? Let’s say your employer chose the minimal graded vesting schedule and you have worked there for 4.5 years. You would be 60% vested in employer contributions, so you would keep 100% of your contributions to your 401(k) plus 60% of the amount the employer contributed. The employer would get to keep the remaining 40% of their contributions. As you have probably already guessed, employers use vesting as an incentive to remain with the company for a longer period of time. By leaving before you are fully vested, you may be giving up a good amount of money. On the other hand, if you will be leaving for a job that offers a much better salary, or you haven’t been at the company long to begin with, then losing some of the employer matching funds may not bother you. When you begin working at a company, or start participating in the 401(k) plan, find out your vesting schedule. Then when you leave the company, you will know how much money you are walking away with and how much you are leaving on the table.